AC Milan coach Gennaro Gattuso suggested striker Gonzalo Higuain wants to reunite with his former Napoli boss Maurizio Sarri at Chelsea. Sarri has made no secret of his desire to bring in offensive reinforcements, particularly if Alvaro Morata leaves the club as expected this month. Chelsea are said to be interested in numerous forwards, but the links with Higuain appear to have been the most persistent. Higuain, 31, is on loan at Milan from Juventus and played under Sarri during the 2015-16 campaign, making him an intriguing option for the Italian coach. 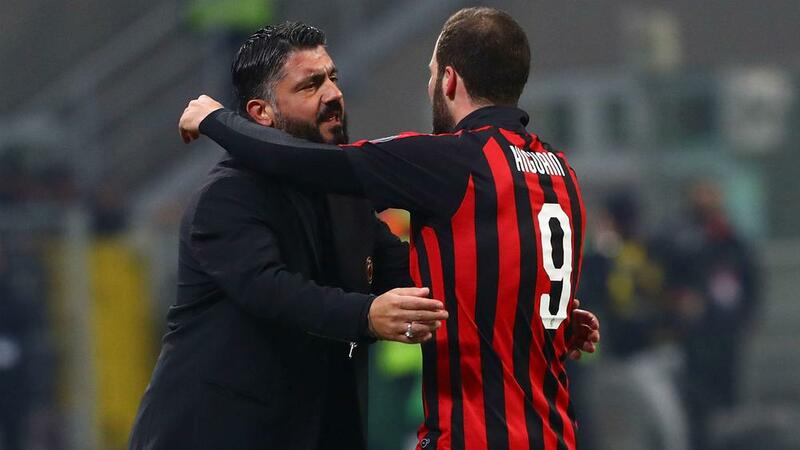 Although Sarri has not openly declared his interest in Higuain, Gattuso seemed to suggest after Milan's 2-0 Coppa Italia win over Sampdoria that the Argentina international wants the move. "When a player chooses, it's hard to convince him," Gattuso told Milan TV. "One can try. "As I've always said, it is often up to the player to choose. He is a Milan player at this moment and we are happy about this, we will hold on tightly to him. "I don't know what will happen in the future. I have a good understanding with Gonzalo, we are very frank with each other." Gattuso added: "I talked a lot with him, but often it's difficult to give advice because the career of a player lasts 13-14 years. "The most important thing is, when you talk to people, you look at each other and say the truth." Saturday's match saw new signing Lucas Paqueta make his debut and Gattuso was impressed, highlighting the former Flamengo star's movement. "I liked the second half when he showed good insertions," said Gattuso. "He is an unusual Brazilian because he is good at his movements."